Edit PDF contents and other elements. Create PDF from other documents. VeryPDF PDF Editor is a helpful application for viewing, editing and annotating PDF. Users can create PDF from other image formats, or even image on system clipboard with this application. It can edit text, hyperlinks and other elements of PDF, and add comments and annotations to PDF. It can also convert PDF to other formats. VeryPDF PDF Editor has a user-friendly interface and any user can quickly learn how to use it. It is a really powerful PDF application of saving time and cost. VeryPDF PDF Editor offers two packages, PDF Editor OCX Control (ActiveX) and PDF Viewer OCX Control (ActiveX). 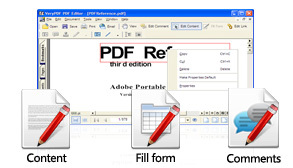 Developers can build functions of editing or viewing PDF in their developed Windows applications. You can get the packages in the Try and Buy page. VeryPDF PDF Editor can implement complete PDF editing operations, like, editing contents of text, graphics and shapes, editing comments, annotations and links. For PDF forms, this application can fill forms of text, check box, radio button and any other field. VeryPDF PDF Editor can create new PDF from image and copied image on system clipboard. It also supports making multiple images into one single PDF. Supported image formats are EMF, WMF, BMP, JPG, GIF, TIFF, PNG, TGA, and PCX. As a PDF editor, besides editing and creating PDF, VeryPDF PDF Editor can save current PDF to other image formats. It supports vector and raster target image formats such as EMF, WMF, BMP, JPG, GIF, TIFF, PNG, TGA, and PCX. It also can save textual PDF to plain text files. Add PDF Digital Signature to PDF file. Copy contents, such as text and image, to clipboard. 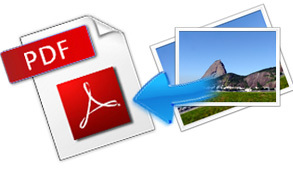 Convert PDF from EMF, BMP, WMF, JPEG, GIF, TIFF, PNG, TGA or PCX format. Convert PDF from any printable document with the help of PDFcamp Printer. Convert and combine multiple files to one single PDF. Convert PDF to BMP, WMF, JPEG, GIF, TIFF, PNG, TGA, PCX, or TXT format. Add Digital Signature, Comment, Annotation, Hyperlinks, Bookmarks to PDF files.